Our vision at Nk’Mip (pronounced ‘Inkameep’) Canyon is to be recognized as one of the Premier Golf Courses in Canada. We will accomplish this by providing both exceptional golf and social experiences while at the same time promoting fellowship and camaraderie among our membership. We will present our Golf Course to a consistently high standard without compromising the natural characteristics and beauty of the land. By doing this we hope to retain our identity as a true championship golf course with playing conditions that are fair and enjoyable by all levels of skill. We will make our entire facility enjoyable, accessible and affordable to all future and existing members, therefore consistently promoting the game of golf. We will strive to exceed the expectations of all our guests and members so that they feel completely at home every time they visit our facility and that they will look forward to their return visit. We will pride ourselves in providing a positive work environment, opportunities for OIB members as a training ground and conduct all business dealings with honesty, integrity and respect. We must believe that everyday is the day that the reputation of our facility will be created and judged. We believe that the team we have assembled will meet the challenge and live this belief. In our pursuit of perfection we will “tolerate excellence”. This level of excellence will not be easily achieved but when it is, we will have reached the level by which other premier courses set their standards. 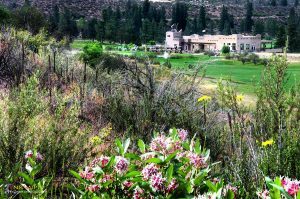 While focusing on the expansion and upgrading of Nk’Mip Canyon Desert Golf Course, the history of the former golf course, Cherry Grove Golf & Country Club seems to have gone by the wayside. Paul Eisenhut Jr. (Eisenhut Insurance) was one of the main people involved in the original project. Before there ever was any golfing at The Grove, the land was leased out and used to grow vegetables, primarily tomatoes. This vegetable business gave up after about four years and the land was just left to revert back to grass. In 1960, Paul Eisenhut Sr., Don Coy and Paul Eisenhut Jr. began working on a lease with the Osoyoos Indian Band. The Chief at the time was Chief Manual Louie. Working with Chief Manual Louie, the Dept. 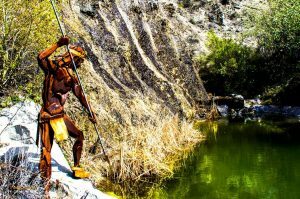 of Indian Affairs, Dave Pugh (the local M.P. at the time), and the Band Members, a lease was finally secured in March of 1961. The term of the lease was 40 years. At this time, two other investors were added to the consortium; Fred Tomlin and Cecil Dugan. The original concept was for an 18 hole golf course, a Motel at Tuc el Nuit Lake and a campground. There were no plans for a Mobile Home Park in the original concept. The original lease compromised 95 acres which included the beach property and the present Mobile Home Park. At this time the Oroville Golf Course had just been built the year before, Fairview Mountain was just a rough 9-hole track with sand greens, and the Osoyoos Golf Course didn’t even exist. The original golf course plans were drawn up by Paul Eisenhut Jr. He made nine different variations on the design until he came up with what the final design of Cherry Grove ended up being. One of the main things governing the design was the cost of the irrigation system. Trying to keep the golf course condensed, working around the power lines, and not making it just a basic layout with all the fairways side by side was a challenge. Another major obstacle to overcome was the fact that Tuc el Nuit Drive, which was more of a trail at the time, came right across the golf course. The road had to be moved and rebuilt at the owner’s expense. It was eventually paved by the Government and that’s how it got to be where it is today. On March 13, 1961, construction started on the golf course itself. With the help of 15 to 20 Band Members, they were ready to plant grass by June of that same year. Because of the summer heat, the irrigation system had to be run 24 hours a day and the sprinklers were moved around the clock to make sure the 40 plus acres of grass would grow. Had they not done this it would have delayed the opening by about a year. In the fall of 1961 the anxious owners and workers opened for one weekend just to try it out. In 1961, 15 acres of peaches were also planted in the area now occupied by the Cherry Grove Estates. The revenue from the peaches was used to help offset the initial cost of the golf course and the operating losses for the first few years. A sad footnote to this part of the golf course’s history was that Paul Eisenhut Sr. died of complications from an operation on May 19th 1961 at the very young age of 59. They were just ready to test the irrigation system when he was taken to hospital. Early in 1962 construction started on the original Clubhouse. The only heat in the building was the wood fireplace. The building had later undergone some additions and remained the core of the operation until June 8, 2000 when it was sadly demolished and the new Nk’Mip Canyon clubhouse became the new home of daily operations. The roof had been salvaged and till this day, because the wood that came off the roof was a clear fir, is still being used to construct picture frames. This is a very sentimental keepsake for the members that still hold Cherry Grove dear to their hearts. In 1962, because money was running in short supply, more investors were brought in. These new investors included Art and Agnes Smok, Bob Gayle, Louie Hannick, and George and Audrey Minns. Finally, approximately on June 15th, 1962 the course was officially opened. Chief Manual Louie and Dave Pugh (M.P.) hit the first balls off the #1 tee box. No one has ever recollected how successful these tee shots were or offered any information so we’ll presume that they went straight and long down the middle. During this time, the golf course was the place to be as far as entertainment went. The stories of many late nights (early morning) poker games, parties, etc. are still legendary among the older golfing circles. In 1965, John Nunes arrived from Portugal to take on the position of Greens keeper. John stayed on until his retirement in the late 1980’s. John did a superb job of maintaining the golf course and is still remembered in the very fond terms by the membership that can still recall those days. It wasn’t until the fourth year of operation when the club started to turn a bit of a profit. An interesting footnote to this part of the story is the total cost for the construction was around $100,000. Today, this cost would only cover building half a hole. The starting cost of building an entire hole from tee box to green today (very basic) will run about $350,000 and increases according to how many obstacles and features you want to add. Paul Eisenhut Jr. ran the operation until the fall of 1967 when it was sold to a consortium out of Prince Rupert. Paul tells us that the long hours required to run the golf course was taking it’s toll and he hardly had the time to spend with his family, so they decided to sell the golf course. Jack and Kay Martin were the main investors. Bob and Tona Armstrong were also investors with the Martins. Bob had worked the outside while Tona worked the inside. There were two other silent partners involved in Cherry Grove, Ernie Sande and Arnold Rennison. The Martins and their investors put the Mobile Home Park in where the peaches were and with the transition of peach orchard to housing development they started to realize a lot more immediate cash returns. The golf course was an attraction for anyone who was looking to buy a house and who also liked golf. The two together proved to be a very good marriage. The successful sales of mobile homes enhanced the cash flow such that it enabled the investors to add on to the present clubhouse, which then enabled them to start holding more functions. This group of investors owned and ran the golf course until 1973 where a couple of other smaller investors, Art and Dawn Heaven bought in by purchasing the shares then owned by Ernie Sande. The ownership of the Cherry Grove remained with this group with its new additions until it was eventually sold back to the Osoyoos Indian Band in 1994. There were only seven years left on the lease, and with this in mind the ownership did not feel the need to upgrade any of the equipment, irrigation system and Clubhouse. Improvements to the golf course were very minimal at best. This was one of the other things that needed to be looked at when the Band took over the ownership of the golf course. Major work and capital investments were necessary to have any chance of being successful in continuing the operation of Cherry Grove. Since the Osoyoos Indian Band purchased the business there has been a dramatic turn around. In the previous years the Band only received $11,698 for the annual lease payment. In 1995, the Osoyoos Indian Band realized $100,000 in benefits from the Cherry Grove Golf & country club. This total did not include the annual lease payment, but also in Band Wages, Band Administration Fees, Government Grant and the operating profits from the golf course operations. On May 1st, 1998, the golf course had taken out a loan with the Royal Bank for the construction of a driving range. Completion of the range with 12 stalls was completed early in July and on the 11th of July 1998, opened for operation by holding a long drive competition. Results of the competition are unknown to me at this time, but the range has proven to be a successful addition to the present facility in the way of an added amenity to offer. It is still one of the better driving range facilities in the Southern Okanagan. 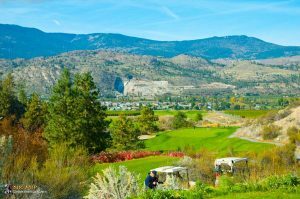 In 1999 the Osoyoos Indian Band decided to embark on some new adventures in the way of Economic Development in regards to the golf course. In a similar fashion to the original investors who built Cherry Grove Golf & Country Club as a means of attracting buyers for their mobile homes, the Osoyoos Indian Band made the decision to expand the existing 9 hole golf course to a championship golf course in the hope that it would spark interest in future plans for a housing development. The Band went to the bank and borrowed $1,500,000 and with their own input of $2,000,000 (approximately) construction on the new course began. The new construction employed quite a number of Band Members from not only the Osoyoos Indian Band, but also other Bands through Western Canada as well as a number of local non-Native residents. A very unique fact in the construction of the new golf course is that the three of our own Band Members were involved in the design stage of the expansion. Sam Baptiste, Tony Baptiste, and Dave George, being the three Osoyoos Indian Band Members, each had their ideas implemented to achieve what we have today as a championship rated golf course. With the efforts of these three along with Tony Patricinio, John Reid and Grant Montgomery, the expansion of Cherry Grove underwent a re-design of 5 of its existing holes and construction of 13 new holes and a new clubhouse. The golf course was then renamed Nk’Mip Canyon Desert Golf Course. 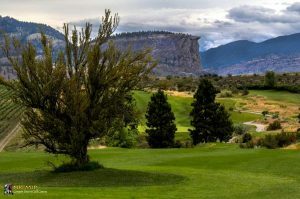 Employing 50 plus people including members of the Osoyoos Indian Band; Dave George, a member of the Osoyoos Indian Band and one of the initial designers of the present Nk’Mip Canyon Desert Golf Course, held the position of General Manager from 2001 – 2007. Dave George returned to the position of General Manager in 2015 and is still here today!